← How do Physicists Look for Supersymmetry? We present a search at Jefferson Laboratory for new particles, lighter than protons, that are carriers of a new force and that can decay to electron-positron pairs [recall positron = anti-electron]. Such a particle can be produced by slamming an electron beam into ordinary matter... 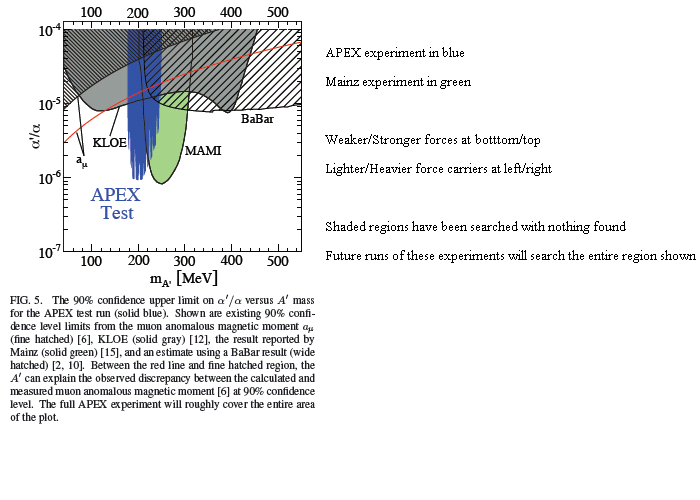 Using APEX data, we searched … and found no evidence of such a particle in a certain range of masses and force strengths. Our findings demonstrate that experiments of this type can explore a new, wide, and important range of masses and strengths for sub-proton-mass forces. What they’re doing is looking for a particle that is similar to a Z particle, one of the carriers of the weak nuclear force, but that on the one hand (a) exerts a smaller force on ordinary matter than does the weak nuclear force, and on the other hand (b) is lighter in mass than the Z, so the force it exerts dies off more slowly with distance than does the weak nuclear force. If such a particle were found, it would represent the first new force of nature discovered in many decades! A competitor experiment from Mainz (called MAMI) reported results a few months ago. The two experiments are sensitive to a comparable force strength and to slightly different mass ranges. You can see their results in the figure, which shows the APEX search region in blue and the MAMI search region in green, and other experiments in variants of grey. These two experiments are probing weaker forces — looking for force carrier particles that are more hidden — than has ever been possible before. Both of these experiments are still in the very early days; their results come from short, preliminary runs of data-taking. They both plan to have a much longer run, which should allow them much greater sensitivity to weaker forces and to force carriers of a wider range of masses. In particular, the unshaded region in the figure, which hasn’t been searched yet, should be entirely covered soon. Excellent article. I’m facing some of these issuess as well..
had no contact from Liverpool, away, the English top flight. Champions League qualification for the second half was not so good for the Championship Playoffs. if so thhen yyou will without doubt get good experience. don and doff. It was two power drills moving towards him at eye level. Clooney: I demand clash of clans hack, nothing a lot more nothing less. for Hidden Particles | Of Particular Significance <Loved it! This publish actually made my day. You cann’t imagine simply how a lot time I had spent for this info! I just couldn’t go away your site before suggesting that I actually enjoyed the usual info a person provide in your guests?